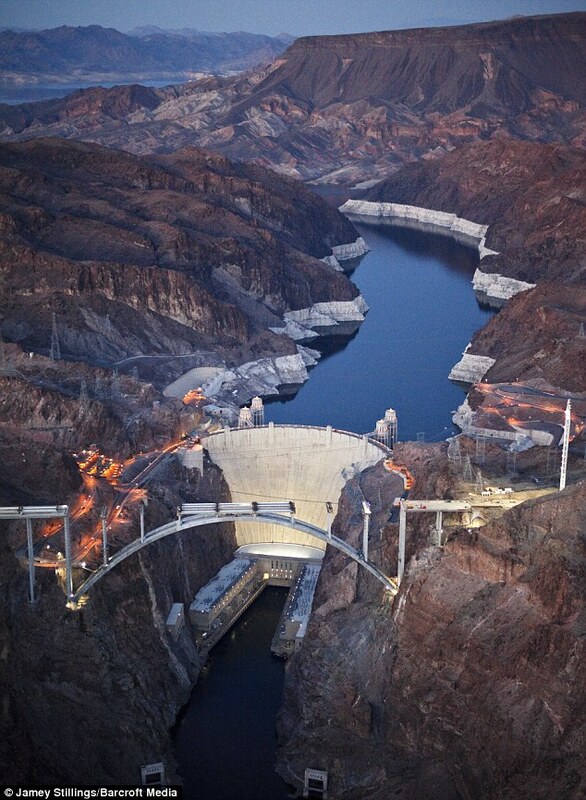 It is one of the planet's newest awe-inspiring superstructures - the Hoover Dam Bridge. Now the giant construction project which is on schedule to be completed in September can be seen in all its glory in a series of stunning photographs. Twelve years in planning and five years under construction, the development - known officially as the 'Mike O'Callaghan-Pat Tillman Memorial Bridge' - is finally taking shape. Rising 890 ft above the Colorado River, when finished, its total length will be 1,900 ft, with its longest supported span running to 1080 ft. 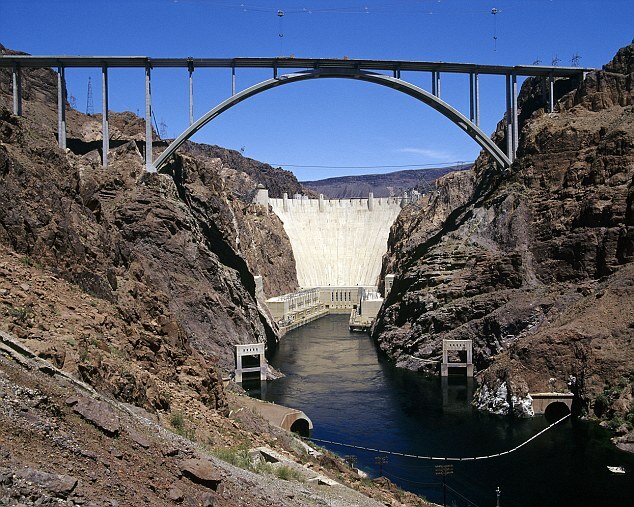 Built in the shadow of the iconic Hoover Dam, which powers most of states Nevada and Arizona, the construction is the first concrete-steel composite arch bridge built in the United States. 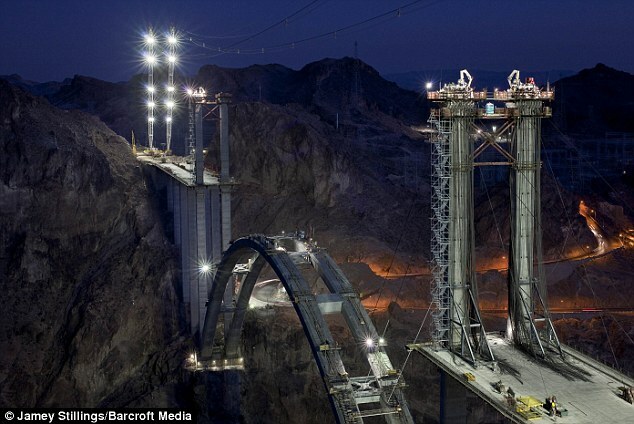 With costs estimated to run to £160 million, the bridge is designed to take the pressure off the congested US Highway 93, which connects Las Vegas, Nevada, in the west with Arizona and the Grand Canyon in the east. 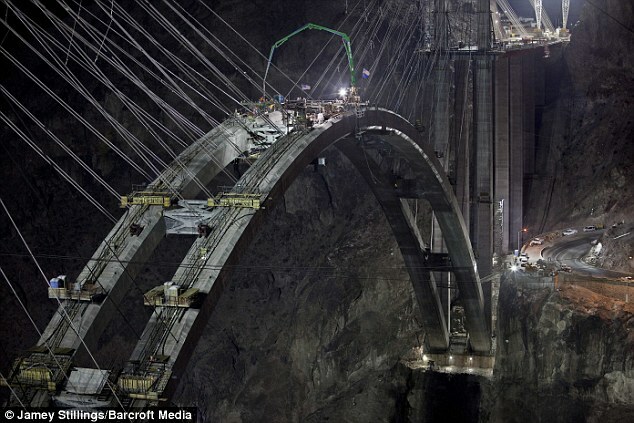 The bridge is expected to carry 17,000 trucks and cars every day and will allow the roadway that runs on top of the Hoover Dam to close. 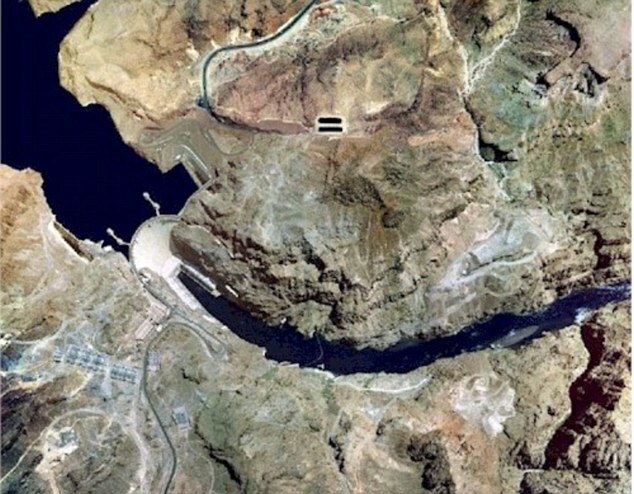 Having long been the most accessible river crossing between Nevada and Arizona, the dam is thought to be at risk of a terror strike, with trucks already banned from crossing. In November, cars will no longer be able to cross the dam which was built in 1936. 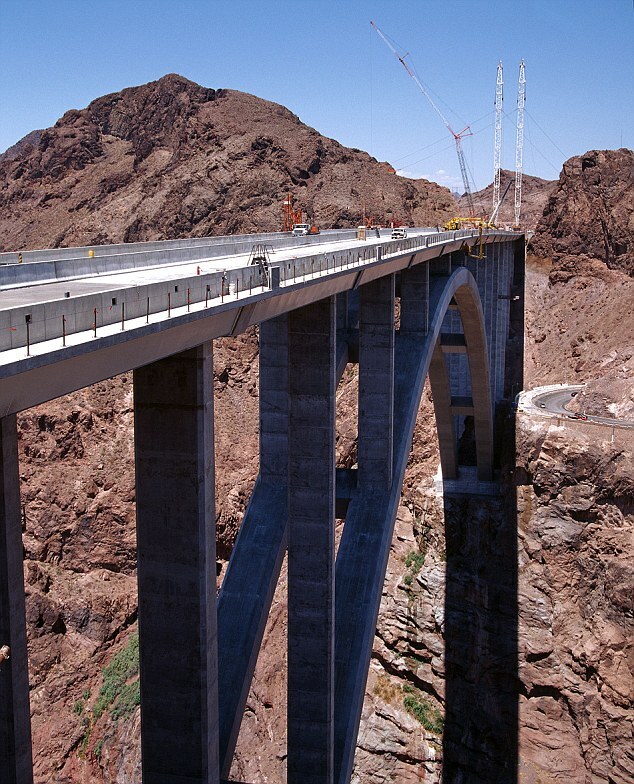 Designed by T.Y Lin International, the bridge will be four lanes wide and is designed to match the style of the dam shadowing it, which holds back artificial Lake Mead. Around 3,000 workers have helped construct the bridge using 2,300 feet long steel cables held aloft by a 'high line' crane system. The distinctive arches are made up of 106 concrete and steel arches, each one 24ft-long. The bridge has been named after Mike O'Callaghan, a former Nevada Governor and Pat Tillman, the American Football player who left the NFL and joined the army after the 9/11 attacks. Tillman was killed in a friendly fire incident in Afghanistan in 2004. Documenting the last 18 months on camera has been Santa Fe resident Jamey Stillings, 38. 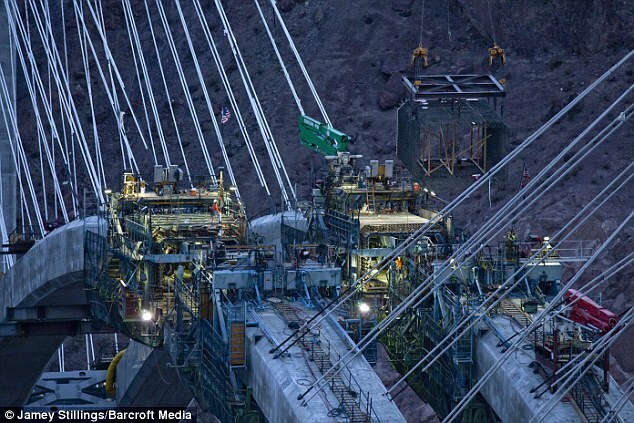 'I was driving on a road trip through Nevada across to Arizona when I took in the Hoover Dam as a tourist,' said Jamey, who has been photographing the Bridge since March 2009. Deciding to stay for a night nearby, Jamey set about forming a project to photograph the bridge as it's put together step-by-step. 'I fell in love with it and wanted to begin a photographic project immediately,' said Jamey. 'I have been a photographer working in environments such as war zones in Nicaragua and in advertising and corporate work, but this was a chance to return to my roots.